It’s Fall, the air is crisp, harvest on the prairie is completed & out come scarecrow decorations in Cottonwood, including a special one at Dog Bark Park. This Saint Bernard-ish lady scarecrow has a chainsaw carved head, wood shavings stuffed body, dog bone necklace & cheerily waves to passersby. Stay away crows & cats - Humans are welcome! 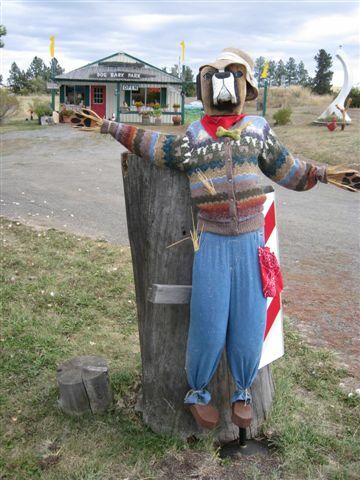 Scarecrows decorate downtown & around town in Cottonwood each Fall. This year the Cottonwood Chamber of Commerce will name a Best of the Best Scarecrow, awarding the winning creator some chamber dollars to spend locally. Each day more decorations appear in town as the calendar ticks closer to Halloween.